See the new review on John Warner's website! Margaret Walters delivered a fabulous night of song at our 9th May Sult living up to her reputation as a very fine singer of both accompanied and unaccompanied song. Her repertoire ranged from the slightly risqué and humorous, with a song about a rather quirky form of “contraception’ to full blown ballads such as her rendition of the Sally Sloane version of the Death of Ben Hall. Her infinite variety of song was enhanced by some subtle accompaniment and harmony support from John Warner. When we heard that Margaret was in the country we decided that it would be essential that she came to sing for us again. Margaret played at the club some years ago accompanied by John Warner, a prolific songwriter of songs about his native Australia. Together they were a "tour de force" and we were intrigued to find out how Margaret would perform solo. We were not disappointed as the familiar quality voice was there and a surprisingly varied programme of material was used. This is usually a difficult thing for an unaccompanied performer as they only have just the voice to do it all. In these days of highly accomplished multi instrumentalism, an unaccompanied singer has to work really hard to keep an audience interested. My only difficulty, and it was a purely personal one, was that her tonal range of her voice was in keys that I found it quite difficult to join in some of the chorus's. And she's got a deep voice too! However this did not detract from a superb evening at the club. We'd certainly consider her again on her next visit to Blighty. For the redoubtable Otley Folk Club, abandoning the horrendously dead acoustics and (let's be honest) often seriously soporific atmosphere of the carpet-drenched upstairs room at the Three Horseshoes, was a brainwave that's really paid off. The club certainly seems to have taken on a new lease of life with the move to Kork's Wine Bar, where it uses the "concert room" at the back of the premises which is kitted out with a neat little stage and plenty of PA and lighting just in case. The second guest-night since the change of venue saw another superb night's entertainment; the guest was that warm and engaging Australian singer who's not seen anything like often enough on these shores. Margaret may not be especially well-known, but there was still a good-sized audience for her, easily and quickly won over by her abundant natural talent and energy. Of course, the icing on the cake (for those in the know) was that on this night Margaret was performing in tandem with our own Duncan McFarlane, and what a partnership it proved! Dynamic in a quietly impressive way, with Duncan providing driving yet sensitive and subtly shaded accompaniments, and fine vocal harmonies to boot. Bless him, he'd learnt much of the material specially (tho' he's had good opportunity, since he's been a sales outlet for Margaret's latest excellent CD Power In A Song!). The highlights were probably Gerry Hallom's setting of Henry Lawson's Outside Track and the duet acapella rendition of Fred Small's potent I Will Stand Fast, but there really wasn't a weak song all night. By way of thanks, Duncan performed the lovely ballad Anderson's Coast (written by Margaret's erstwhile touring partner John Warner) -but also couldn't resist inveigling M into join him on his own Can't Go There! So well done "Squeezy Steve" on managing the club move so successfully; he's always had the knack of booking top-drawer guests, but if the recent storming (and packed!) singers' nights are anything to go by, the club has an assured future indeed. Choosing to relate the story of the disastrous Gundagai flood of winter 1852 in a song and verse cycle must have raised challenges many and mighty. The resulting CD is ample evidence that the very talented team, led by composer / author John Warner, have met the challenges head on and produced a work of great quality and substance. The original Gundagai settlement was made on the Murrumbidgee river flats despite warnings from the local Koori people about severe flooding. When the inevitable happened and the township was washed away, eighty-nine (known) people lost their lives - over one third of the European population of the town! This figure may have risen by half as much again or more if not for the heroic behaviour of local Wiradjuri man, Yarri, who repeatedly risked his life in his bark canoe returning to the wild floodwaters to rescue those stranded, one by one. Within the nature of the project the CD manages to provide quite a thorough historical document. There has obviously been a great deal of research and consultation but, even more impressive to us, is John's rare ability as author to ask the pertinent questions rather than simply speak for the characters. This complex three-sided story - European, Wiradjuri and Murrumbidgee - is told here with compassion and insight. There is an exploration of the material considerations of the settlers in contrast with the nomadic flexibility of the local inhabitants. How can you reward a hero who has no regard for wealth or possessions? There is conflict, but also a common humanity discovered between the mothers of both tribes in their fears for the children of the valley. Through the whole story is woven the inexorable ebb and flow of the Murrumbidgee and her daughter, the creek, as the spirits of the place, the hands of fate, and characters in their own right. The combination of narration by John Derum, and performances by fine singers and musicians sits very happily in the ears. There is a strong sense of melody throughout. The dominance of chorus songs leaves you singing parts of the CD after only one listen. We get the feeling that the songs will find their way off the CD and into peoples repertoires. Of course, this will ensure that Yarri's story will be told far and wide for years to come: a great result! The CD is technically excellent. It looks great, has a thorough and helpful booklet and sounds terrific. At a time when every man and his dog has a CD to sell it is rare to see a product that stands this far out from the crowd. Congratulations to John and all the crew. The launching of the long awaited CD of John Warner's "Yarri of Wiradjuri" was appropriately held in Gundagai, as the story tells of the heroic deeds of a local Koori, a Wiradjuri. John Warner's composition and the performance from many of the best folk musicians deserves to become an Australian classic and this CD should reach all Australian audiences. 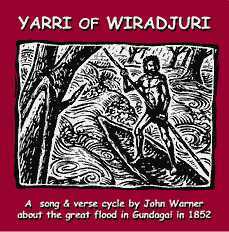 Yarri's rescue of many white settlers when the big flood of the Murrumbidgee came in 1852, is told in a song cycle of haunting harmonies and powerful verse. This moving musical epic starts with a very haunting melody line, then builds up to the moods of coming flood and disasters: "White man fool to camp on the low ground/ Big water come down". The denouement raising questions about "What reward do we give the hero/Who won back lives from the rivers hand?" The use of traditional tunes backing the words brings a melancholy mood which alternates with the songs of positive vigour, such as "Yarri's bark canoe"
There are songs of protest about what Yarri and his people have lost with the coming of settlers who don't understand the rhythm of the land and touching moments between settlers as they try to come to terms with unforgiving seasons and to support themselves in the unfamiliar territory. Margaret Walters and Jennifer Lees have attained a fine balance in their duets and the complex harmonies and contrapuntal rhythms have developed splendidly since I first heard them sing about 10 years ago. They achieve an eerie quality which is very moving especially in the Mother and Daughter spirit of the river song when they sing of the white settlers: "They do not feel how the land's life is pulsing". There is a hymn like quality about a number of the songs, which could be described as Australia's own unique spirituals. The combination of John Warner's brilliant use of poetry and strong imagery with a professional production of excellent performances from all singers and musicians makes listening to this CD many times a must for all interested in Australian heritage and music. This is Margaret Walters' welcome second solo CD release. Margaret, a stalwart of the Sydney Folk scene for many years, has also recorded with The Roaring Forties and John Warner. A listen to the CD immediately reveals certain pertinent things about Margaret. Her obvious love of singing shines through this collection of "powerful" songs. Her appreciation of a good song with a chorus is demonstrated by her discriminating selection. An intrinsic part of any song is the lyric and Margaret's clear, expressive vocals sit well in the mix of each of the fourteen songs. The CD is off to a solid start with the rallying Windsong in celebration of the strength of the miners' wives in South Gippsland during industrial turmoil. This is the first of four songs written by the talented John Warner. They are a highlight of this selection. The piano and mandolin accompaniment to Warner's Llewellyn Walking, for example, is a delight. Henry Lawson's Drover's Sweetheart, set to a beautiful melody by the late Chris Kempster, emphasises Margaret's ability to evoke an appropriate mood by her expressive, understated delivery. There is a capable interpretation of Jez Lowe's Old Hammerhead. The CD ends on a high point with Margaret joined by John Warner in the song Joe Hill. The inclusion of Margaret's reading of Joe Hill's "will" to introduce the song is both inventive and effective. Margaret is accompanied by a talented group of musicians, including Nancy Kerr and James Fagin, under the very capable musical direction of Kim Poole. This song collection includes a nice balance between traditional material and contemporary compositions. Also included are informative notes about the songs by John Warner. With this CD Margaret has presented us with a thought-provoking collection of "powerful" songs. Her vocal delivery and interpretation have also given new "power" to many of them. Margaret Walters looks out from the cover of this solo album with kindly blue eyes and you like her before you have heard a note. Margaret is from Sydney, Australia and has made a number of records both alone and with others. One of her co-recordists is John Walker [sic], with whom she toured England in both 1994 and 1998. She was here on her own last year. There are 14 songs, 5 of them traditional and the rest contemporary. Four of these are written by Warner and there's one, lamenting the demise of a dockside crane by Jez Lowe. Margaret is aided on this album by Nancy Kerr, James Fagan, Kim Poole and Warner. The performance is intimate and very personal. It's possible to imagine that she is there in the room singing to you. Among the songs, I particularly liked 'Llewellyn Walking', 'Largo' and 'Murrumbidgee Water' (all Warner songs) and the trade union ballad 'Joe Hill' . The album is distributed in England by a friend, Duncan McFarlane. I think it's worthwhile investing in a copy. This is Margaret’s second solo album and it celebrates what Margaret does best – singing songs full of interest, meaning and beauty … and singing them well. There are some good songs from all the main groups: Trees They do Grow High (~ My Bonny Lad is Young), Death of Ben Hall, When McGuinness Gets a Job, Maria’s Gone and Van Diemen’s Land from the TRAD camp—A Henry Lawson song, Drover’s Sweetheart; Faraway Tom (Dave Goulder), Old Hammerhead (Jez Lowe) Joe Hill (Hayes/Robinson), Ballad of Many Crows (Andrew Burke) from modern writers and Windsong, Llewellyn Walking, Largo, Murrumbidgee Water and then a setting of Ballad of Many Crows by Margaret’s singing/performing partner John Warner, who also contributes some effective accompaniments. The musical backing comes from a range of fine local and British musicians: Lara Biernoff (harp), James Fagan (Irish bouzouki & whistle), Ruth Hart (flute & whistles), Nancy Kerr (violins & viola), Stephanie Osfield (vocals), Kim Poole (guitar, mandolin, banjo, bouzouki, accordion & harmony vocals), Michael Spencer (piano) and John Warner (guitar, Irish bouzouki) … and Blair Slater (wind sounds). The very thoughtful arrangements—allowing full space for Margaret’s voice to be the central element of the song— supported by a well-chosen harmony on harp, flute, piano, stringed instrument or vocal line … were worked on by all the participants, but continue to show the fine touch that Kim Poole has brought to earlier recordings by Margaret—or the duo Walters & Warner. John Warner’s fine new songs in a solid folk tradition feature, as they should—ranging from childhood’s first steps (in Llewellyn Walking), celebrating the nature of this land Australia (Murrumbidgee Water) and the determination of women supporting their men (Windsong) … to his setting of Andrew Burke’s song lamenting rural suicide (Ballad of Many Crows). All these have strong tunes and meaningful words that come to life with Margaret’s strong, characterful voice and clear statement. I’d not heard of Margaret Walters till this CD hit the doormat, just beating an industrial action of exactly the kind which the first song celebrates. That’s probably my fault. I’m ignorant of Ms Walters’ home folk scene in Australia, and it’s nice to catch up a bit... Stirrings readers will have heard of a few of her collaborators though: at least, I’d heard of John Warner, author of several of these songs and also the sleeve notes, and the backing band features none other than Nancy Kerr and James Fagan, in their parallel southern hemisphere co-existences. The Pommie influence doesn’t stop with Ms Kerr: Jez Lowe takes writing credit for Old Hammerhead, a lament based on the image of a disused shipyard crane, and Dave Goulder for Faraway Tom, a portrait of an old nomad; and Peter Bellamy crops up as the immediate source of the anonymous standards The Trees They Do Grow High and Maria’s Gone. Otherwise the dominant authorial presence is John Warner (Windsong, Llewellyn Walking, Largo and Murrumbidgee Water), and Australian tradition (The Death of Ben Hall, Van Dieman’s Land, When McGuiness Gets a Job) and trad-style written song and poetry (Drover’s Sweetheart, Ballad of Many Crows). The collection is completed by Alfred Hayes’ 1925 song commemorating the Swedish-American trade unionist songwriter, Joe Hill, with a recitation of Hill’s own ‘will’, a haunting final poem written the night before his execution on a fairly trumped-up looking murder charge in 1915 . Margaret herself has got quite a presence as a singer. Her voice is strong with a refreshing edge. Her singing tends consistently towards the gentle side – possibly leaving room for a bit more attack, to this listener’s ears at least – but her voice carries a weight of experience and powerful emotions with unforced dignity. And there’s quite a few powerful emotions to get round, as the album deals with the primal themes beloved of folkies and the songs they sing: death, hardship, struggle, the small achievements of childhood, the hardness of the lives which the majority of human beings have led, and the power of nature. My personal favourites are Joe Hill, the driving When McGuiness Gets a Job and John Warner’s hymn-like Murrumbidgee Water. Overall, this is heartfelt, proficient, and certainly worth a listen. Margaret, from Sydney (Australia), has in the past toured England (though not often enough in my opinion) with husband [sic] John Warner, most recently in 1998. Her repertoire majors both on John's original songs and on her strong reinterpretations of traditional and contemporary material, these elements being well reflected in this magnificent new CD. Its central thesis is entirely admirable, and is succinctly expressed by John himself on the sleeve: "the power of words and music -to life the spirit, to unify the powerless in causes, to make and change relationships, and to tell the story of our eternal struggle with ourselves and our environment - is a vital resource in humanity's survival". And in Margaret's case, the power is in the warmth and understanding and generosity of spirit that she brings to her interpretations, fully reflecting her personality and extensive knowledge of the repertoire. She doesn't need to apologise for making the songs truly her own by singing them! Her voice is richly expressive yet unpretentious in its direct and unassuming way of telling the stories in the songs - notwithstanding the undeniable intellectual (as well as musical) effort needed to do them true justice, which Margaret evidently appreciates and brings to her readings. Biernof and Kim Poole, Margaret has produced a lovely CD of really lasting value. Margaret Walters lives in Sydney, Australia and is very well known in that part of the world of course, but she has also occasionally been seen over here, usually with her singing partner and fine song writer John Warner. Their joint CDs Pithead in the Fern and Who Was Here? are quite well known in the U.K. but this is her first [sic] solo album. As might be expected there are a number of John's songs in the track list including the lively Windsong, the moving Llewellyn Walking which has a lovely sensitively played piano accompaniment from Michael Spencer, Largo inspired by the story of Xerses as envisaged by Handel and, one of my favourites, Murrumbidgee Water. Margaret has also chosen a few traditional songs that have gone through the folk process in their travels to Australia. These different versions of Trees They Do Grow High, Maria's Gone, Van Dieman's Land and the, now very Australian, Death of Ben Hall make a refreshing change. Being Australian she had to get a Henry Lawson poem in too—Drover's Sweetheart (super tune set by Chris Kempster) and Britain is represented with Dave Goulder's Faraway Tom which is well sung here and Jez Lowe's Old Hammerhead which I have to admit (sorry Jez and fans) is new to me. The well known Joe Hill completes the 14 track CD. Musical arrangements are overseen by musical director Kim Poole of [Western] Sydney University's Music department and if his credentials weren't enough Margaret has enlisted the help of James Fagan, Nancy Kerr, Ruth Hart, Lara Biernoff, Stephanie Osfield, and the aforementioned Michael Spencer and John Warner—well, let's face it, if you're going to make a CD in Australia you might as well get the best to join you! Which is why I can say this is one of the best! Available over here via Duncan.mcfarlane@ntlworld.com or phone him on 0113 2256989. Ever since I have known Margaret Walters - some twenty-five years now - she has been singing and searching out songs. We shared a house once, and I was struck by her need to sing at all times, wherever she was, whatever she was doing! I love to sing too, but there was never any conflicts with apportioned time. If anything there was just more harmony about the place. She always seemed to have a wealth of songs at her disposal at any given moment, and she was able to learn and memorize them instantaneously, it seemed. I was quite envious of her repertoire! This album, appropriated named "Power in a Song," showcases a number of the many unusual and compelling folk songs Margaret has been collecting over the years. It is also a testament to some of her greatest song points as a singer. Her ability to nose out wonderful songs, putting her own special stamp on them, the emotion she puts into the songs, using her amazing voice to bring out the story or the mood; the instincts she has for the right arrangements and the right musicians and singers to accompany her. The music is oriented towards Australian and British historical and contemporary themes, with a great variety of mood, ranging from the dark Largo (by John Warner) to the romantic Drover's Sweetheart (Henry Lawson/Christ Kempster). The arrangements are superb, never repetitive and featuring some of the finest musicians on the scene today, such as James Fagan and Nancy Kerr and John Warner. While the arrangements are a sensitive and powerful underscore to the songs and the stories, there are a couple of instances where as I listened to the CD I felt they actually overshadow the voice. (In fact, I found one of my favorites to be "The Death of Ben Hall", which was sung with great feeling but with no accompaniment at all.) And there were a few times when I wished Margaret had developed more fully some aspects of her wonderful voice. But these are only details. Power in a Song is a commanding album, a strong collection of find traditional and contemporary songs sung with commitment, musicality and beauty. This is a beautiful CD. I bought it unheard - because I love Margaret and everything she stands for in the folk community - and have been delighted to find it has become a source of solace and peace and joy for me in the most unexpected of ways. Margaret was one of my first 'role models' in the folk scene - an independent, unrepentant, powerful woman singing songs about things that matter and grabbing any opportunity she could to do what she clearly loved the most - to sing. Over the years, her work has been a constant yardstick of the continuity of the folk tradition delving into the depths of traditional material, but also open to the creations of the best of our contemporary folk songwriters - notably John Warner. This CD is a classic Australian folk recording - and ought to be in the collection of any folkie that values our living culture, but also anyone who loves their music warm, rich, and filled with love. The production is gentle and the list of guest musicians an indication of the respect accorded to Margaret by those who know her worth - James Fagan & Nancy Kerr among many. I have more favourite songs than I can mention: traditional ones like Trees They Do Grow High and Maria's Gone; Lawson's Drover's Sweetheart as set by Chris Kempster; and a swag of the best of John Warner's remarkably well-crafted and pure-spirited work, including Llewellyn Walking, Largo, and Murrumbidgee Water. But the track that brought tears to my eyes with no warning was the spoken intro to Joe Hill where Margaret reads Joe's 'will' as written by Joseph Hillstrom. As I have listened more and more to this CD - it has come to me that what defines it most is Margaret's voice - both the laughter and the tears she manages to convey in her tone, and her unrelenting faith in the words she is singing. And I have decided that, if the earth itself had a voice, this is what I think it would sound like. Not so very young, not so very innocent - but full of strength and wisdom and heart. Power in a Song indeed. The new album from the Australian singer Margaret Walters is very well named—the power of a song as put over by a first class singer, the power of a song to reflect upon and even change the world. The songs are mainly outside the mainstream and mainly Australian, four of them by long-standing collaborator John Warner, but the themes are universal. One venture into the traditional, Trees they do grow high, with Nancy Kerr on viola, is a particularly compelling and hypnotic version of this magnificent song. Otherwise we are in the world of labour disputes, the hardship of life in the bush (especially for bushrangers, vide Death of Ben Hall) and the primal landscape of Australia (inevitably the Gundagai [?Murrumbidgee?–Ed] makes an appearance).There are particularly cogent versions of Jez Lowe's Old Hammerhead, a typically angry response to the Thatcher years imbued with the spirit of Boys from the Blackstuff, and the labour 'anthem', Joe Hill. As if Walters' strong, pure voice and a way of putting over a song with truth and immediacy weren't enough to make this an outstanding album, there is excellent instrumental (and occasionally vocal) support from Nancy Kerr and James Fagan and striking Aboriginal [sic] images on the leaflet and disc itself. In a way this is a courageous album. Because Margaret is not hiding behind rich or lush instrumental backing, and because she is not afraid to stand up-front and let her voice and her interpretations of the songs speak for themselves. The instrumental accompaniments are mostly very sparse, but they suit the voice, the songs and the purpose of the album, as they make you pay attention to the meaning and depths of the songs - "the eternal struggle with ourselves and the environment". There are several songs by John Waters [sic], some by other writers, and traditional ones mostly from English and Australian backgrounds, ranging from historical to contemporary. The CD's theme of Power in a Song is a great one, and it's explored and developed very successfully here. And so to songs. 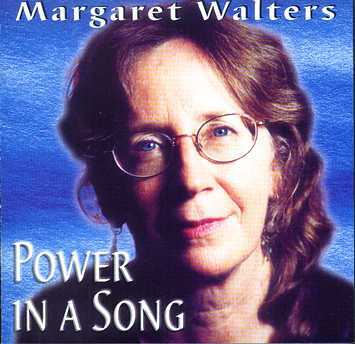 Branch member Margaret Walters has just released a CD Power in a Song, a collection of material gathered over some 20 years of performance, musicianship and recording. It is a powerful, compassionate, wide ranging album, dealing with working life, childhood, Thatcherite Britain, the relationship between human beings and the Australian environment, Australian rebel history, concluding with a moving rendition of '']oe Hill'. In an age of lies and cliches and the abuse of power, it is wonderful to hear heartfelt words and music and to know there is a vital, rich recording and performance tradition alive and well beyond those sanctioned and supported by the media conglomerates.